Design of the An-10 airliner began in November 1955 and the prototype (named Ukraina) first flew on 4 July 1957. 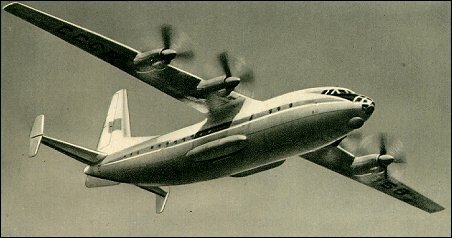 The An-10 was the initial version with accommodation for 84 passengers and a room at the rear. It entered service in July 1959 on routes from Simferopol to Moscow and Kiev. The An-10A developed version had a 2m longer fuselage and accommodated 100 to 130 passengers. It entered service in February 1960. An-10A also operated on skis in the far north of the Soviet Union. No An-10/10A were exported and Aeroflot withdrew the airliners in 1973 after a series of crashes. 104 were built. Both versions had the NATO reporting name Cat. From this was derived the An-12 military and civil freighter, with redesigned rear fuselage incorporating a cargo-loading and air-drop ramp. The An-10, accommodating from 84 to 130 passengers, was designed as a bulk passenger carrier for remote and under-developed regions of Russia.